Lunchbox Dad: Review: Chuao Chocolatier's Flavors Are Unique, But Will They Please Everyone in the Family? Review: Chuao Chocolatier's Flavors Are Unique, But Will They Please Everyone in the Family? Some people think one chocolate is as good as another. Those people are wrong, dead wrong. Ever since I saw the movie Willy Wonka, as a child, I have been infatuated with this dark, sweet, amazing food. When I found Chuao Chocolatier at the Fancy Food Show in San Francisco awhile back, I knew they were different. The only question was if they were too different to appeal to adults as well as kids. Readers of my blog know that I review products from the perspective of the entire family. Chocolate is no different. I know I don't usually review dessert products here, but you cannot go through life avoiding good chocolate. If you do, you should be arrested. In this review you will find my family's take on Chuao Chocolatier chocolate and some ideas for how we used it. Just don't drool on your keyboard while reading it. Chuao Chocolatier was founded by Chef Michael Antonorsi and his brother. They feature many different specialty chocolates and even alcohol and chocolate pairing packages. You really need to see their website to look at the myriad of choices they offer. I like that their chocolate is ethically sourced and made with natural ingredients. Chuao sent me samples of their truffles, bars, and chocopods. Let's start by talking about the flavors that my kids enjoyed. By far their favorite was the Pop Corn Pop chocopods. Chocopods are mini 2-3 bite chocolate bars. The Pop Corn Pop flavor is very unique because they literally pop in your mouth as you chew them. They reminded me of Pop Rocks candy. My kids also enjoyed the Potato Chip bar. It sounds strange but it is crunchy and salty mixed with sweet milk chocolate. The flavors worked perfectly together. One other personal favorite of mine was the Orange-A-Go-Go. If you like fruit flavor in dark chocolate, this is the bar for you. 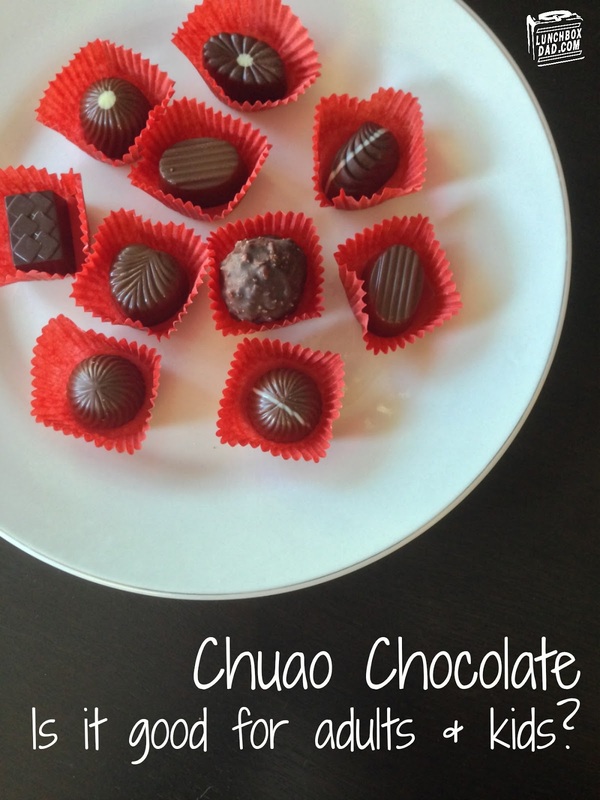 One kid-friendly recipe we tried was Chuao chocolate and popcorn. We had a movie night and served it to our kids. They loved it! 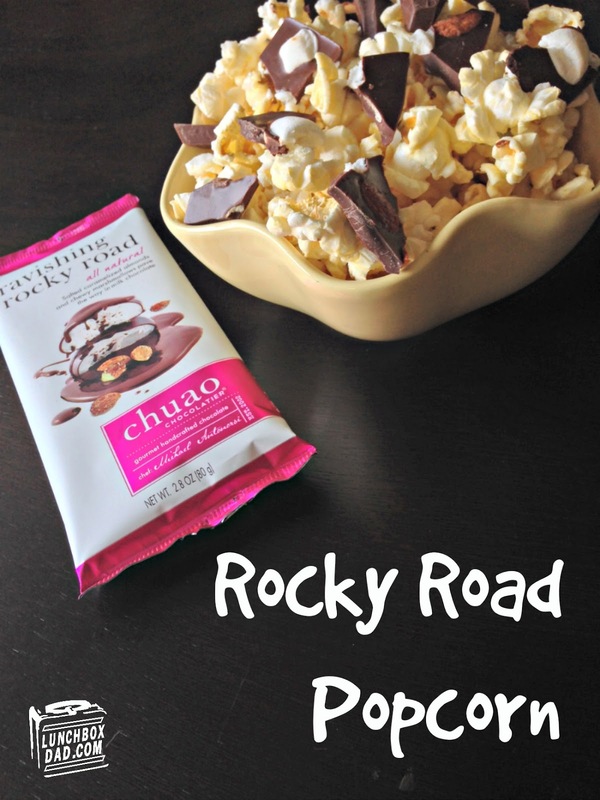 We tried a few different flavors but Rocky Road was by far the winner. In second place was Maple Bacon. One note about the Maple Bacon flavor was that kids and adults at our house did not prefer it by itself, but paired with popcorn it tasted great. Since Chuao tries some very interesting pairings with their chocolate, my family and I came up with an adult recipe that was a fun and different take on a typical side dish. We put chocolate in salad. That's right, and we used it for dinner! We had my in-laws over and included Chuao's Honeycomb chocolate bar. It is honey that has been caramelized into crisp bits, and combined with dark chocolate. 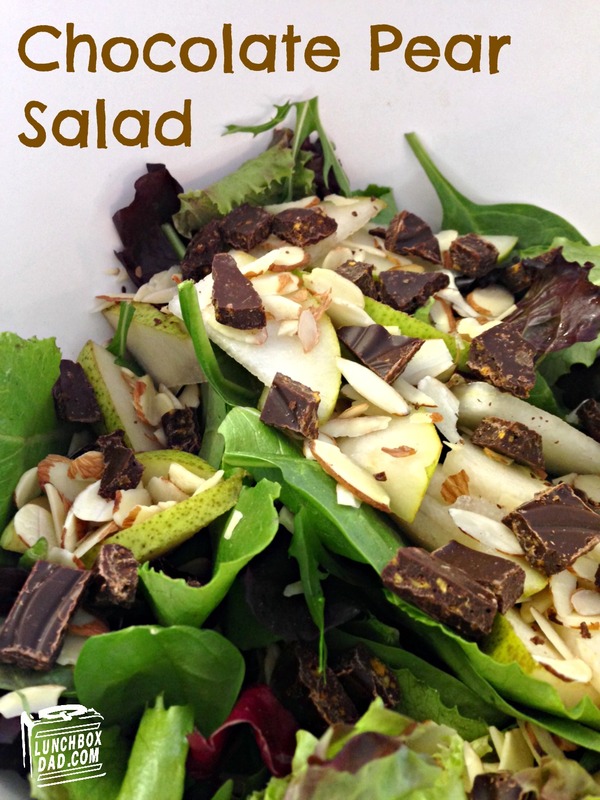 We used most of one bar and combined it with sliced pears, mixed greens, and sliced almonds. It was topped with a honey mustard vinaigrette which gave the salad some moistness, but didn't have an overpowering flavor. The salad was so good and unlike any other salad I have ever tasted. When it comes to the truffles, Chuao produces distinctive flavors that I haven't seen other places. The truffles are small, but work for an adult tasting plate when you are looking for flavor over quantity. 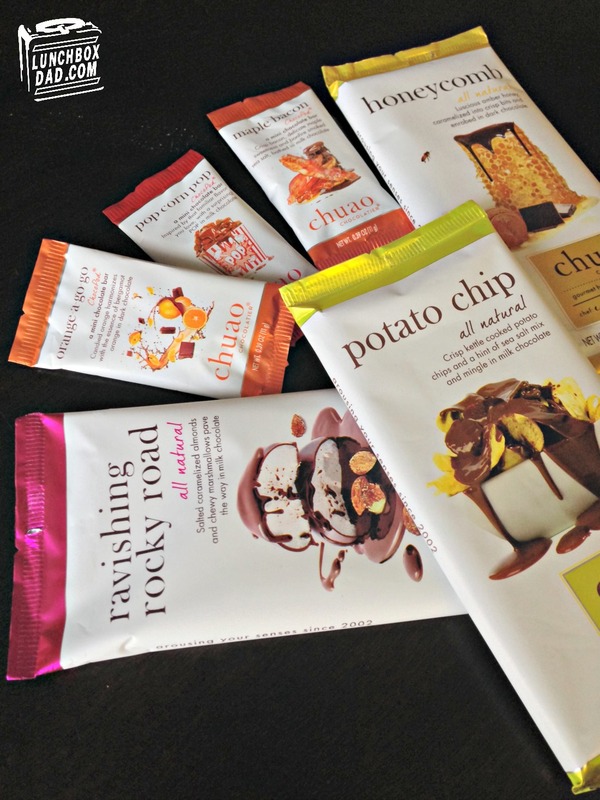 Chuao sent me their Caramel Chic and Sultry Sea Salt varieties to try. My top three choices were the Dulche de Leche, Bananas Foster, and Firecracker. Honorable mention goes to the Goat Cheese and Pear. All of these were unique, the flavors were strong but not overpowering, and I would definitely get them again. The truffles that didn't work for me were the Strawberry Seduction, Maple Bacon Caramel, and Rosemary Salt Caramel. One note about the Rosemary Salt Caramel flavor. My friend, who loves Rosemary, really liked this one. It seems that this is a polarizing truffle. Chuao Chocolatier makes varieties of chocolate that you just can't see anywhere else. The great thing about this is that you can definitely find flavors that you and your kids will love. You might have to taste a few samples before you find the flavors that you like the best, but lets be honest, there are worst things in the world than taste testing different types of chocolate. To find out more, go to www.ChuaoChocolatier.com. Disclosure: Chuao Chocolatier sent me this product to review. I have received no other compensation for this post and the opinions I’m expressing here are solely my own. Some of those flavours sound so weird yet very interesting!! Thanks and yes there are some very unique flavors!